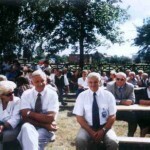 The celebration of the anniversary in Ostrow Wielkopolski. Gazeta Poznań – Appendix Ostrowski posted a ceremony in which Circle No. 34 UN SKMP took an active part.